Sun's out, fun's out! All Part of the Awesome Afternoon at El Oceano! Sun’s out, fun’s out! There are no better places to chill out and have fun with friends than the Pool Bar at El Oceano! Start your Awesome Afternoon with a light-bite from the Lunch Menu, then retire to the pool for a table or private VIP bed! 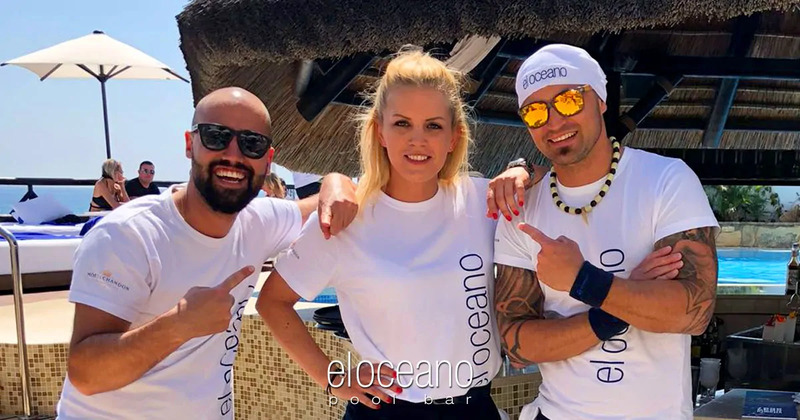 Sun, sea, sensational shenanigans at El Oceano! Home » Blog » Sun’s out, fun’s out! If playing in the warm, Mediterranean sunshine sounds good to you, there’s nowhere better than El Oceano!! We have just the thing for the perfect summer sunshine afternoon! Start your Awesome Afternoon with a spot of light lunch, made with true care by our master chefs, just the right thing for a warm day! Once you’ve finished your meal, take a stroll down to the terrace and the Pool Bar. Sun, sun, sun!! And views of the ocean that will take your breath away! Make sure you get the place you want and book a table around the bar for the afternoon, where you’ll enjoy the best cocktails, or maybe a bottle of champagne! New for 2018… share a shisha!! Fruit (non-tobacco) shisha pipes are available in the garden, for those who like a little dash of the ‘exotique’ to their already Awesome Afternoon! Waiting just for you, our excellent Pool Bar Team, Jose, Nora and Sandor, have everything under control to make your afternoon is just perfect! And don’t for get your sunscreen! El Oceano Beach Hotel, Restaurant & Beauty Salon between Marbella and La Cala de Mijas: Sun’s out, fun’s out!